Foot pain is common after a long day of work, but it can also be an indicator of a more serious problem. Years of working all day on your feet can lead to a condition called Plantar Fasciitis. With this condition, a thick band of tissue on the bottom of your foot is inflamed. This band, called the plantar fascia, surrounds muscles and nerves in the foot. It extends from the heel to the ball of your foot and supports your arch. The condition is a result of poor support and stability. In fact, years of wearing subpar work boots can cause the issue to arise. 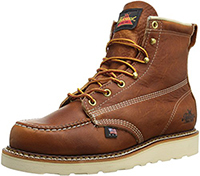 To help alleviate the pain and prevent the condition from getting worse, it’s imperative that you invest in a quality pair of work boots that are designed to give you support and comfort. Here are 7 of the best work boots for Plantar Fasciitis. 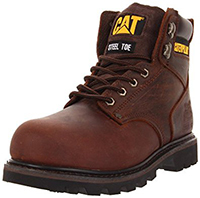 These work boots from Caterpillar are designed to give you comfort throughout the work day. They have a contoured insole that hugs your feet and provides support as you work. The insoles are removable to make maintenance much simpler. The inside of the boots also has a unique Climasphere lining that regulates temperature and wicks away sweat. The outside of the boots is made from durable oiled leather. The rubber outsole is designed to absorb shock. With a moderate heel, they also help to reduce pressure. The boots are slip-resistant, shock-resistant, have a steel toe, and incorporate a full lace closure system for added comfort and safety. 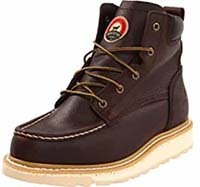 From Thorogood, these boots look great and have a number of comfort features to alleviate pain. The insole is made from dual-density foam that works to absorb shock. There’s also comfort cushion throughout. The lining is made from soft cotton that can help to prevent abrasive damage. To add stability, a fiberglass shank is built directly into the outsole, which is made from a shock-absorbing synthetic material. The soles also have a tread design that makes them slip and oil-resistant. The uppers are made from an attractive oil-tanned leather. Laces allow you to get the perfect fit up the 6-inch shaft. 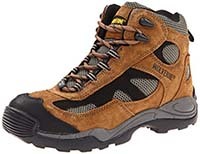 These boots from Wolverine are much lighter than traditional boots but contain the same levels of comfort and protection. The uppers are made from a combination of suede leather and breathable nylon. Inside, mesh lining promotes airflow to keep you dry. There’s also a removable footbed that contains thick cushioning. An EVA foam insole helps to provide support to your arches. It’s contoured to match the anatomical curves of your feet. There’s also a fiberglass shank to keep your foot stable. The thick rubber outsoles are slip-resistant and help to absorb some of the force of impact. If you’re worried about toe protection, these boots also have a steel toe cap. With their slick and modern design, you’d never guess that these boots are made for keeping you comfortable as you work. They have a removable polyurethane footbed that helps to provide some shock absorption. The EVA midsole is included to give you arch support and further cushion as you work. The outsole is also made from EVA. It’s thick enough to absorb even more shock while helping to relieve pressure from the plantar fascia ligament. It also has great traction and meets electrical hazard safety standards. The uppers are made from full-grain leather for a polished look and ultimate durability. These unique boots combine the best features of lace and zipper closure systems. The laces extend up the 8-inch shaft to get a comfortable fit while the durable zipper allows you to throw the boots off in a matter of seconds. Inside the boots is an absorbent EVA midsole. It’s soft enough to cushion your foot but firm enough to support your arch. For further support, a fiberglass shank is built into the outsole. The rubber outsole is designed to be slip and oil-resistant. The uppers utilize a combination of durable leather and breathable nylon. These boots have a relatively short shaft at 5.5 inches for greater agility and movement as you work. The uppers are made from durable leather. 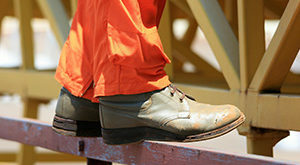 There’s also a larger steel toe so that your toes have room to move while staying protected. To help support your feet as you work, the shoes utilize a contoured footbed and a cushioned midsole that absorbs shock. 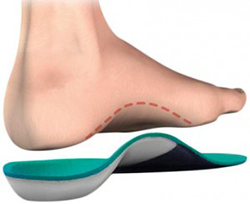 The footbed is made from open-cell foam and has an antimicrobial cover to keep bacteria and odors at bay. The rubber soles of the boots are roughly 1.5 inches for stability and are made to be slip, abrasion, and oil-resistant. If you suffer from Plantar Fasciitis and have wider feet, these boots may be for you. They come in a variety of wide sizes to accommodate anyone’s feet. 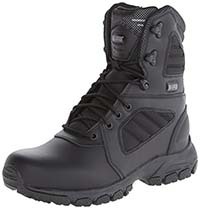 Inside, the boots contain light padding for comfort and support. To help keep your feet in a stable and healthy position, the boots have a lace closure system. The boots also have a medium-sized heel. Overall, the outsole is quite thick and bulky. This can help to add stability without the added weight of a steel shank. The bottom of the soles also feature a versatile tread design that can provide you with traction regardless of the surface you’re on. All of these factors can cause strain and pressure on the ligament. The arches of your feet aren’t being supported, so the force of impact from every step is placed directly on the tendon. Over time, this strain can cause inflammation or even tearing. Worst of all, the effects of irritation are felt long after you’ve gotten off your feet. You may feel it while you’re relaxing after work or even when you get out of bed the next morning. When you wear shoes that are made to tackle Plantar Fasciitis, you’re supporting your arch and spreading the force of impact. These shoes are specially designed to relieve pressure off the ligament. The pain you feel from the condition can take months to get rid of, and that only happens if you stop straining the ligament. By wearing the right boots, you can promote healing, prevent further damage, and stay protected from future inflammation. To adequately relieve pain from Plantar Fasciitis, you need to find boots that imitate the functions of the ligament. Your boots will provide the support you need. In addition to standard safety features associated with your job, here are some unique comfort features you should look out for. Foot support is the most important feature to look out for. Boots should have a durable insole that’s shaped to provide you with arch support. The insole should have more than just a raised bump in the middle. They should be contoured to match the unique curves of your foot. Many manufacturers include anatomically correct footbeds that are slightly lowered and combine both firm and soft cushioning. This unique design hugs your foot and provides different levels of support at various spots for the most stability. Shock absorption is important for spreading the force of impact to ensure that your feet don’t experience the blow. While walking may not seem like it’s doing damage, the shock of walking on hard surfaces like concrete will do a lot of damage over time. Boots should provide a high level of absorption by combining unique features in both the insole and outsole. It should go without saying that comfort is important. Many shoe manufacturers include a variety of comfort features to prevent pain from Plantar Fasciitis and a number of other foot conditions. Gel or cushions on the insole can also help to absorb some of the shock. With ample padding throughout the inside of the boots, your foot is also well-protected from issues like chafing, blisters, and more. You should choose boots that have a medium-sized heel. Too much height will create tension on the ligament. This is because the brunt of your weight is placed on the ball of your feet. Alternatively, a low heel doesn’t give you enough support. Flat boots have virtually no support and put pressure on both the heel and ball of the feet. A medium-sized heel is a healthy compromise. It gives you enough support while also helping to place your foot in the proper position. To treat the condition and alleviate pain, your feet need to be in a healthy position. They should be supported well and move appropriately as you walk. With all the previous features, your feet are placed in the right position. However, they’ll do no good if your feet slip. It’s a good idea to go with lace-up boots that allow you to get a snug fit throughout. Laces should cover the top of the foot and rise up your ankle to ensure that your feet won’t slip out of position. Plantar Fasciitis isn’t something that you just have to deal with. There are a number of ways to help alleviate pain and keep you healthy. 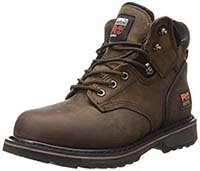 With the right pair of boots, you can stay comfortable as you work and prevent strain on your feet from causing you issues after you’ve left the worksite.